Due to an emergency, there is only one ticket left for Monday’s trip. Tickets are $40 ($45 for non-members). You may contact Nancy Wilson with questions at nanwil60@aol.com. 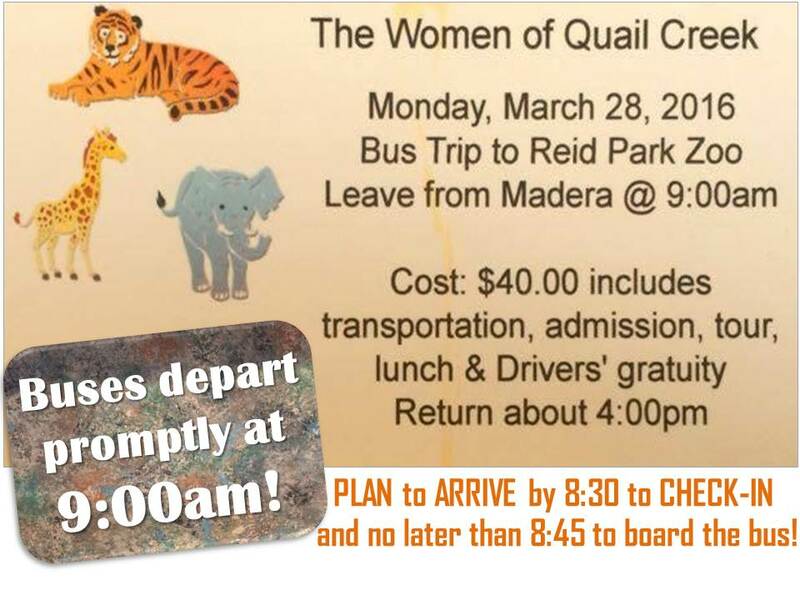 Please be at the Madera Clubhouse by 8:30am but no later than 8:45am for check-in as the buses will depart from the Clubhouse promptly at 9:00am on Monday, March 28, and return around 4:00pm. If you plan on purchasing tickets for margaritas or wine at lunch please bring correct change ($5 per ticket) as we will not be keeping a bank on the bus. Suggestions are to wear comfortable walking shoes, sunscreen and possibly a hat. Water will be available at the zoo all day. There will be free time to visit the gift shop and/or explore the zoo on your own. Your bus “leader” will explain where you will need to be when. If you’d like to participate in the Baby Bottle Bus Challenge, be sure to bring any loose change, dollars or checks to stuff in the Big Baby Bottles for the “baby’s starter college fund”. We appreciate all of you who choose to participate in this fun game of… which bus will win? If a last minute emergency occurs and you can’t attend for any reason, please let us know as soon as possible (even if it is that morning – we need to know). This way we won’t wonder if you are on your way as the buses are leaving the parking lot. By Sunday evening: call Peggy McGee (207-6188 home), Janice Pell (405-9731 cell), or Nancy Wilson (400-0488 cell). If you need to cancel Monday morning, call Janice or Nancy on their cell phone prior to 9:00am. We have new numbers again! We currently have: 11 Military Moms, 18 Military Dads for total of 29. Our Baby totals currently are 30: 6 boys, 14 girls and 10 unknown. The next Honor Flight will be departing Tucson Airport on Saturday, April 23 at 6:30am and returning to Tucson on Monday, April 25 at 5:50pm. If you have never been at the airport to send off or greet these Veterans when they return, I highly recommend you do whatever it takes to participate in this event. It is a very emotional and patriotic opportunity! Please consider writing letters to the Vets on this flight thanking them and honoring them for their service to our country. The appreciation is overwhelming! For names of the 25 Veterans on the upcoming flight please access THIS LIST. For further information you can access the Honor Flight website at honorflightaz.org. You may also contact Karen Baker at kkbaker1714@gmail.com or Nancy Lammers at plammers1@cox.net. Letters for the Veterans may be dropped off at Karen’s home @475 N. Keyes Road. Karen has a box on the front porch for you to place the letters. Letters must be submitted no later than April 11th. Many thanks for your support and contributions! 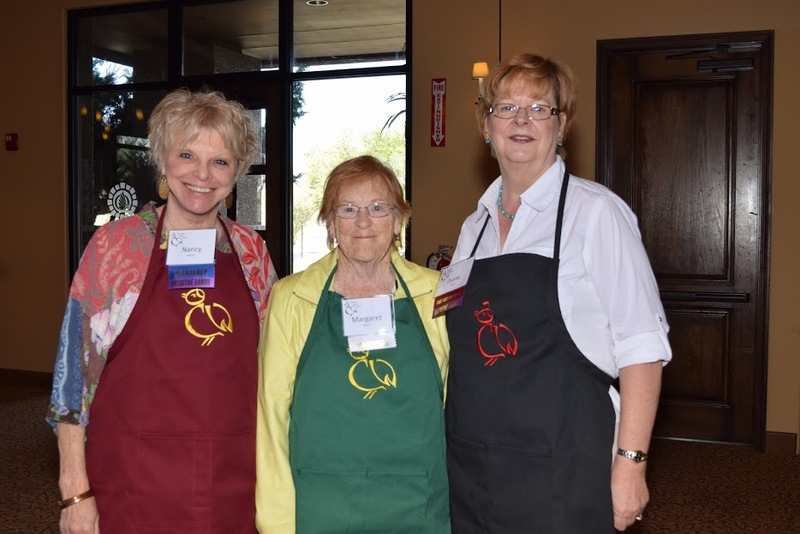 Nancy, Margaret, and Diane show off three of the apron colors! 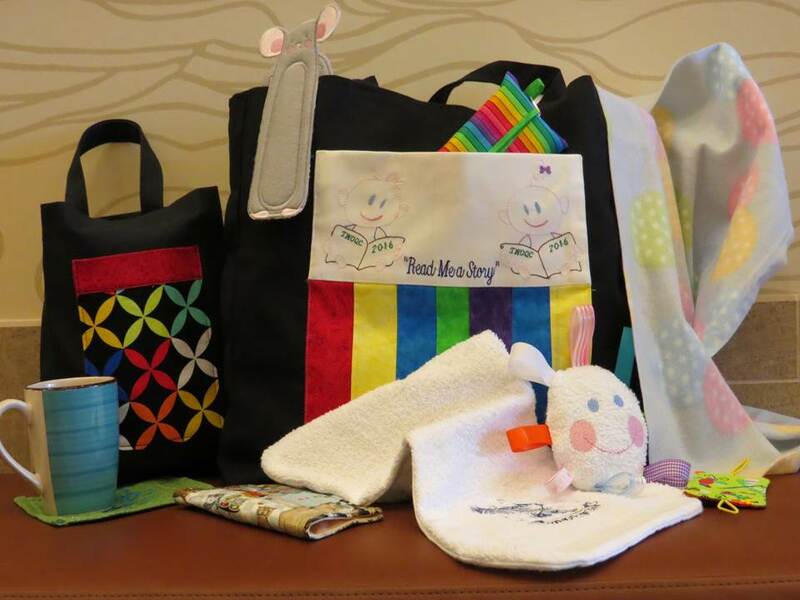 If you didn’t get a chance to purchase an apron at the Spring Crafts Festival and want one before our next program, please contact Peggy at pjmcgee@cox.net or 207-6188 to arrange for pick-up. If you are going to someone’s house for Easter, you might consider an apron to take as a hostess gift. Aprons are $18 or 2 for $35 with all proceeds going to Youth on Their Own, a non-profit whose mission is to keep homeless teens in school. To learn more about this program please click the banner below. 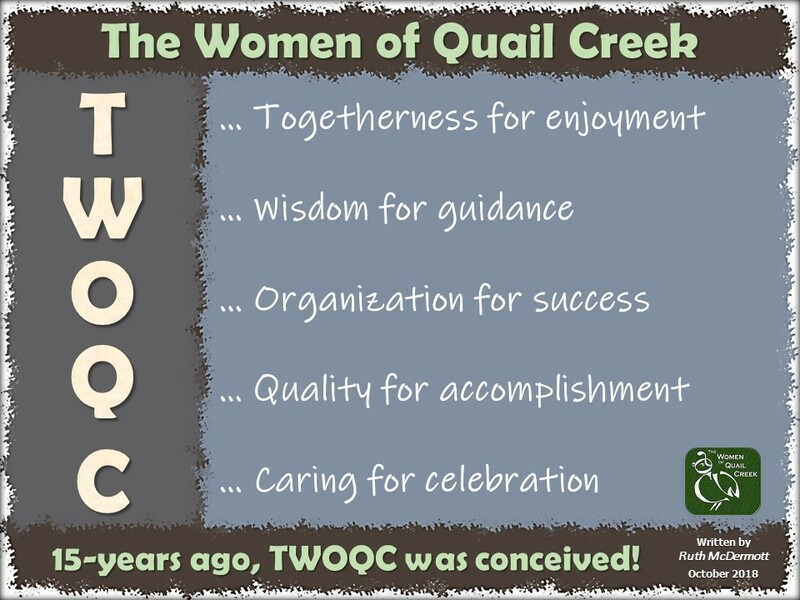 April 25 – 6:30pm …Prickly Pear Cactus presented by Cheri Romanoski, and TWOQC Scholarship Award Presentation. You might start preparing for our semi-annual collection for the food bank. We will be taking donations at this program!